I watched the second season Amazon’s “Marvelous Mrs. Maisel” almost purely for the splendiforous wardrobe, as I’m not that into the bar scene and this show’s jokes aren’t that good. 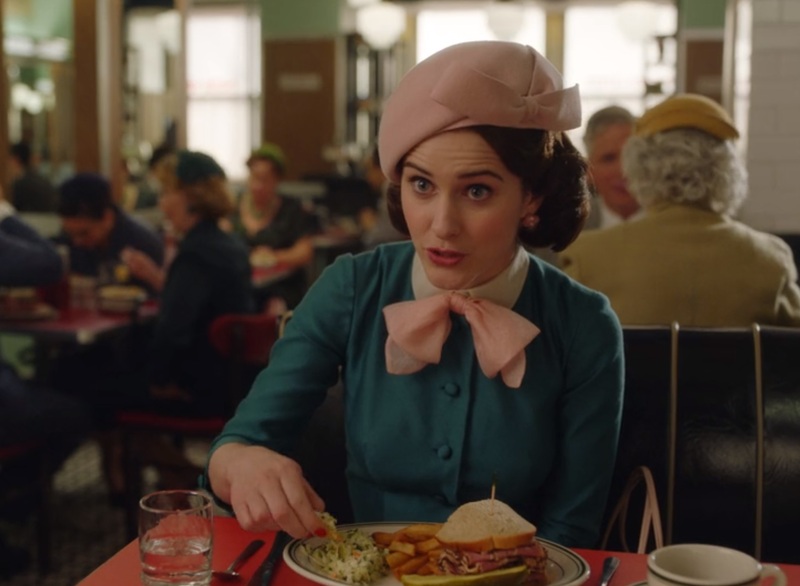 Perhaps the most fabulous thing about the massively self-absorbed Midge Maisel, played like a modern Mary Poppins by Rachel Brosnahan, is her clothing. It’s gorgeous. Of course, there are a few freak show items, such as these from episode five, at the Catskills resort where the family spends half the second season. All three of these are horrific, not just Midge’s, but her pattern combination is certainly the worst. It’s not like her at all, besides being objectively ugly. Regardless, if I had millions of dollars I’d hire the show’s stylists to redo my closet and wear those clothes out in public every single day. But I don’t, so I can just ogle them and share. The real fashion fabulosity of this season seems to start a few episodes in. Here is Midge smoking up her kitchen while on a phone call with her manager, Suzie, in episode five. Midge’s worst outfits from this season are when she departs from the 1950s to dip her toes into the 1960s, such as in the awful gingham trio above. Midge’s yellow flower child getup with the twisted hula hoop hat below isn’t quite that bad, and it has some charm, but her mother Rose’s elegant outfit far outshines it, especially by comparison. In episode five, Midge goes on a date with new fling Benjamin. Note not just the glorious jeweled color here but also the neckline. This is obviously very 1950s, and very Midge. But it’s more of the Midge she’s leaving behind in the last decade than who she’s turning into while spending the wee hours in smoke-filled lounges. Here it is in a full-length version. I’m not a huge gingham fan but the overlaid bold flower print and wide black belt here really makes it wearable. Rose’s wardrobe easily competes with her daughter’s. Her education in Paris has obviously affected her sensibilities, which she obviously passed on to her daughter. In this pairing, however, Rose looks much better than Midge does. Every time Midge gets 1960s, she looks worse. What is that weird strap thing going on, and that horrible florescence in this dress? Ew. Rose, however, also goes bold but instead looks good while doing it. In the diner with Suzie, Midge sets off this dress with one of her seemingly endless and exquisite hats. At home later that night with her family, she’s lost the hat but you can see more of this sort of collared precursor to a shirtdress. Another beautiful jewel tone. I don’t know what Midge is wearing when she gets the phone call from Shy Baldwin asking her to open for him on tour. I don’t care. It looks awesome. Here’s a little more of it as she’s standing up at home on the phone, then with another matching hat while celebrating in Suzie’s kitchen.